Ht / Wt: 6'2" / 206 lb. 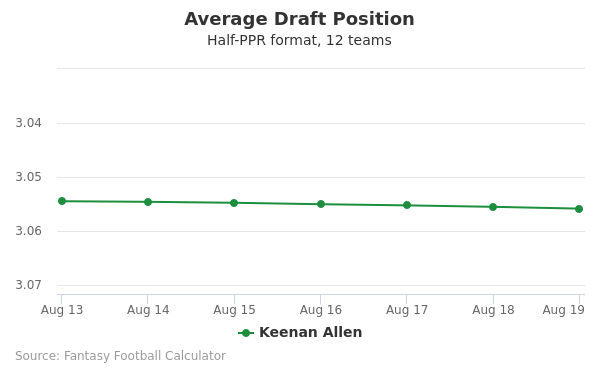 Keenan Allen's fantasy value is measured by his average draft position (ADP) in fantasy football mock drafts. 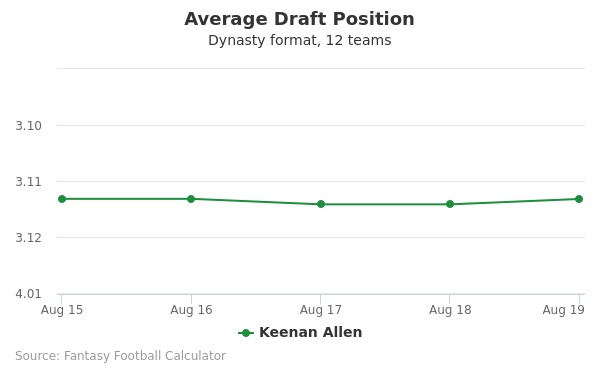 In recent drafts, Allen's current ADP is 3.08, which indicates that his fantasy outlook is to be the 8th pick of the 3rd round, and 32nd selection overall. The code below will display a graph that updates every day to show the ADP data for Keenan Allen for the past 30 days in 12-team PPR leagues. Draft George Kittle or Keenan Allen? Draft Keenan Allen or Mark Ingram? Draft Aaron Jones or Keenan Allen? Draft Amari Cooper or Keenan Allen? Draft Keenan Allen or Phillip Lindsay? Draft Derrick Henry or Keenan Allen? Draft Keenan Allen or Stefon Diggs? Draft Aaron Rodgers or Keenan Allen? Draft Devonta Freeman or Keenan Allen? Draft Chris Carson or Keenan Allen? Draft Brandin Cooks or Keenan Allen? Draft Derrius Guice or Keenan Allen? Draft Andrew Luck or Keenan Allen? Draft Keenan Allen or Kenny Golladay? Draft Keenan Allen or Kerryon Johnson? Draft Cooper Kupp or Keenan Allen? Draft Eric Ebron or Keenan Allen? Draft Keenan Allen or Robert Woods? Draft Julian Edelman or Keenan Allen? 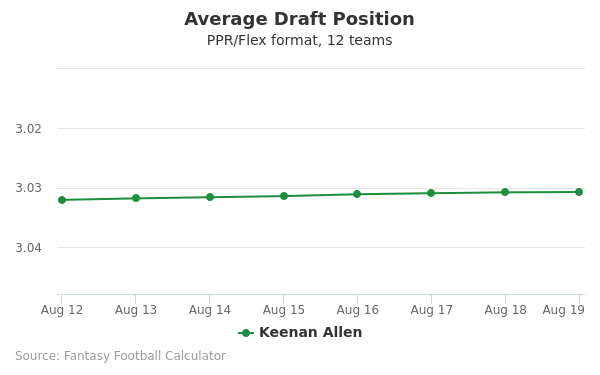 Draft Keenan Allen or Tarik Cohen? Draft Baker Mayfield or Keenan Allen? Draft Jarvis Landry or Keenan Allen? Draft Alshon Jeffery or Keenan Allen? Draft Keenan Allen or O.J. Howard? 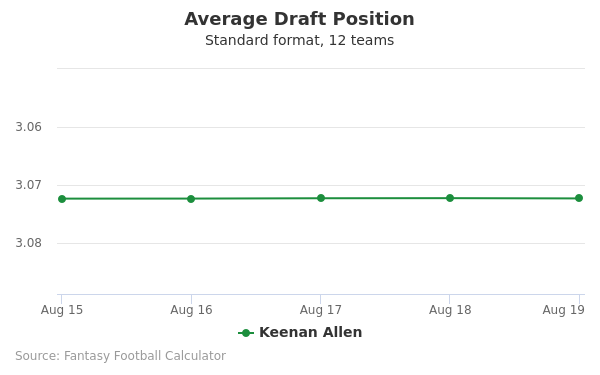 Draft Keenan Allen or Tevin Coleman? Start George Kittle or Keenan Allen? Start Keenan Allen or Mark Ingram? Start Aaron Jones or Keenan Allen? Start Amari Cooper or Keenan Allen? Start Keenan Allen or Phillip Lindsay? Start Derrick Henry or Keenan Allen? Start Keenan Allen or Stefon Diggs? Start Aaron Rodgers or Keenan Allen? Start Devonta Freeman or Keenan Allen? Start Chris Carson or Keenan Allen? Start Brandin Cooks or Keenan Allen? Start Derrius Guice or Keenan Allen? Start Andrew Luck or Keenan Allen? Start Keenan Allen or Kenny Golladay? Start Keenan Allen or Kerryon Johnson? Start Cooper Kupp or Keenan Allen? Start Eric Ebron or Keenan Allen? Start Keenan Allen or Robert Woods? Start Julian Edelman or Keenan Allen? Start Keenan Allen or Tarik Cohen? Start Baker Mayfield or Keenan Allen? Start Jarvis Landry or Keenan Allen? Start Alshon Jeffery or Keenan Allen? Start Keenan Allen or O.J. Howard? Start Keenan Allen or Tevin Coleman? Childhood and High School: Allen was born and raised in Greensboro, North Carolina. He attended high school at North Guilford and Grimsley, where Allen starred in football and track & field. The USA Today named him to their 2009 high school All-American team, and he was selected to play in the U.S. Army All-American Bowl game, which honors the top high school players in the country. The highlight moment in the game for Allen was returning a punt and kickoff each for 33 yards. In track & field, Allen was an exceptional long-jumper, with his best jump going over 22 feet. Also, he competed in the 40-yard, 100-yard and 400-yard dash. Allen attended the University of California, Berkeley because they were one of the few schools to recruit him as a wide receiver. Most recruiting services graded Allen as a five-star defensive back in their national rankings. He elected to leave Cal after his junior season, Allen left as the school’s leading receiver with 205 catches for 2,570 yards and 17 touchdown receptions. Allen’s best season was his sophomore year, which had him catching 98 passes for 1.343 receiving yards. The San Diego Chargers selected Allen with the 76th overall pick in the third round of the 2013 NFL Draft. He first came on the team’s radar after GM Tom Telesco attended the Cal/USC game in 2011. He came away impressed by his vertical jumping ability to catch the football. It didn't hurt that Allen has a career afternoon by catching 13 passes for 160 yards. Prior to the draft, Allen participated in Cal’s pro day, and his performance was quite disappointing. He ran a shocking 4.71 40 time that looked labored from the start. It wasn't a surprised that his draft stock took a definite plunge. The Chargers offense desperately needed to replace Vincent Jackson, who left for the Tampa Bay Buccaneers via free agency. The coaching staff expected Allen to challenge for the position in training camp. He quickly developed chemistry with starting quarterback Philip Rivers, and together, they provided big passing afternoons in the regular season. Allen finished his rookie campaign with 71 receptions for 1,046 yards and eight touchdowns. In the first quarter of his sophomore season, Allen looked a bit tentative running his pass routes. The Chargers training staff felt nagging leg injuries contributed to his struggles on the field. Once, he gained some practice time, Allen took advantage of cover mistakes across the middle of the field for big yard plays. His breakout game came against the Jacksonville Jaguars as he caught 10 passes for 135 yards. Allen finished the year with 77 catches for 783 yards and four touchdowns. Allen was emerging as one of the top wide receivers in the NFL, as no coverage scheme seems to faze him at all. In the season-opener, Allen tied Kellen Winslow’s franchise record of 15 receptions in one game. He was on pace to shatter the Chargers single-season mark in receptions and receiving yardage before suffering a season-ending kidney injury. In eight games, Allen caught 67 passes for 725 yards and four touchdowns. Here are his 2015 highlights. Prior to training camp, the Chargers signed their talented receiver to a salary contract increase worth more than $44 million. High expectations were suddenly shattered when Allen suffered an ACL tear with a little over two minutes left in the first half of the season-opener. He finished the season on injured reserve for the third consecutive year. Allen didn’t participate in the 2013 NFL Combine due to a posterior cruciate ligament (PCL) sprain that occurred in the regular season. In 2014, Allen missed the final two games of the regular season after sustaining a broken right collarbone against the Denver Broncos. In 2015, Allen suffered a season-ending kidney injury after catching a touchdown pass against the Baltimore Ravens. In the Chargers 2016 season-opener, Allen tore his anterior cruciate ligament (ACL) in the final two minutes of the first half against the Kansas City Chiefs, and missed the remainder of the regular season. Allen comes from an athletic family as he played at Cal with his half-brother Zach Maynard, who was a quarterback on the football team. Together, they combined for the longest (90 yards against the Washington Huskies) touchdown pass in school history. Allen’s cousin is Washington Redskins wide receiver Maurice Harris. Like most professional athletes, Allen has a twitter account @KEENAN_ALLEN.